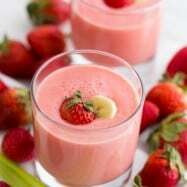 This strawberry spinach smoothie is love at first sip. It is ridiculously easy to make and is packed with all-natural, healthy ingredients making this the perfect snack! 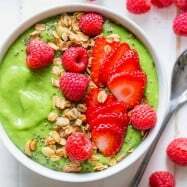 Juicing has its place but what I love about smoothies is you retain the fiber from your fruits and veggies which is so important for your digestive health (Don’t worry, I won’t go into more detail than that, although I could since I am a Nurse which means I am NOT shy about this topic. I can be eating a snickers while discussing issues of the digestive system)… sorry. Now I’ve done it. Really sorry. I know it may be a difficult transition for some of you but lets get back to the recipe. 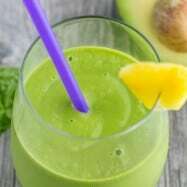 You can make this smoothie without the spinach if you like, but I’ll have you know it doesn’t change the flavor much to add it. Spinach will just make your smoothie healthier. It’s a great way to sneak in veggies for kids who otherwise won’t eat them. Thanks for all of your awesome smoothie suggestions on Instagram. 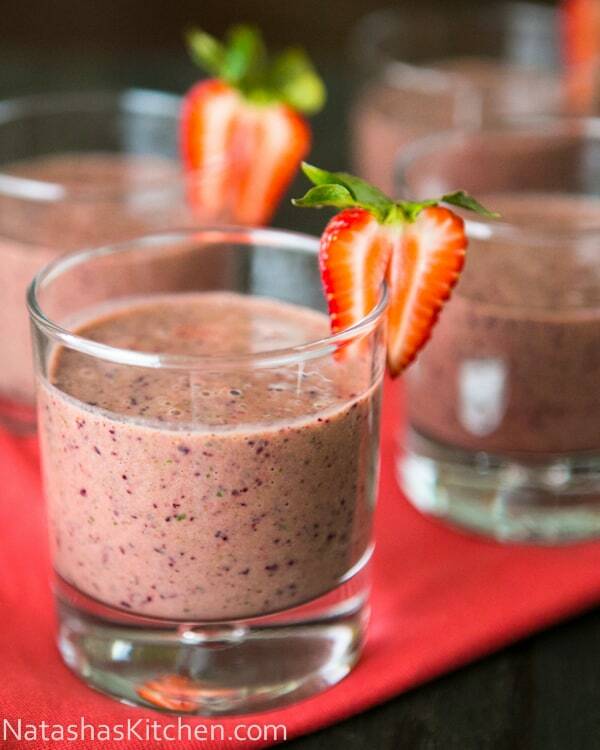 Because of you, we discovered this strawberry spinach smoothie. 1. Add the liquid ingredients first: 1 cup mango (or orange) juice, 1/2 cup yogurt. 2. Add in the 1/2 lb strawberries, 1/2 lb blueberries, 1 banana (broken into a few sections). Using your blender blend until smooth. 3. Add in the 1 cup fresh spinach and drizzle with honey to taste. Blend until smooth and serve to the folks eagerly waiting in line. These strawberry spinach smoothies were love at first sip. They are ridiculously easy to make and are packed with all-natural, healthy ingredients making this the perfect snack! 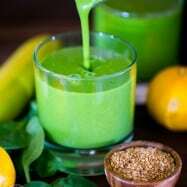 You can make this smoothie without the spinach if you like, but I'll have you know it doesn't change the flavor much to add it. 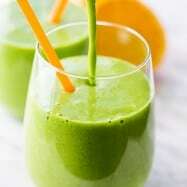 Spinach will just make your smoothie healthier. It's a great way to sneak in veggies for kids who otherwise won't eat them. Add the liquid ingredients first: 1 cup mango (or orange) juice, 1/2 cup yogurt. 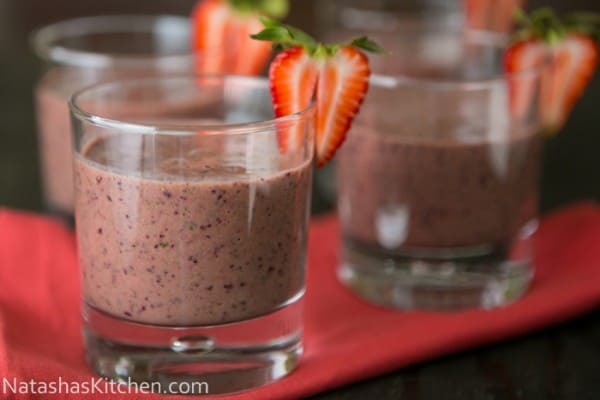 Add in the 1/2 lb strawberries, 1/2 lb blueberries, 1 banana (broken into a few sections). Blend until smooth. Add in the 1 cup fresh spinach and drizzle with honey to taste. Blend until smooth and serve to the folks eagerly waiting in line. Thanks for stopping by. It means a lot to me; really! I hope you enjoyed the video. Made this tonight for the first time and it’s delicious!!! Awesome, I’m glad to hear that!! blog and have been thinking about using the WordPress platform. 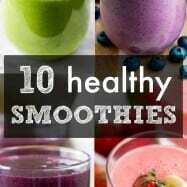 I tried this smoothie, and it was delicious!! I made it before I went and worked out, and my trainer was pleased to hear I had consumed it. Being a nutrition graduate, I didn’t see the nutritional information, such as carbs, sugar, etc. Can you post it? Yes, I can add up the info for myself, but others might want to know. In my opinion, those pieces are so much fun to have in your smoothie) its like eating fruit without chewing it:-) but still tasting tiny pieces of the fruit) I think its great! Its starting to look like we are the only ones without one! I got my at Costco and I told my husband lets test it, we can return and get Ninja if we decide its not worth our money. We love Jumba Juice so this was an investment for us because smoothies we made were just like at Jumba.